According to the recent State of the Cloud Survey from Rightscale, 81% of enterprises have some sort of strategy to leverage public and private cloud solutions. As companies continue to utilize the cloud more and more, many IT organizations are interested in shifting the directory service to the cloud as well. However, in order to move the on-prem directory service to the cloud, there are a number of features that need to be in place. One of the core capabilities is the cloud directory feature Windows® device management. 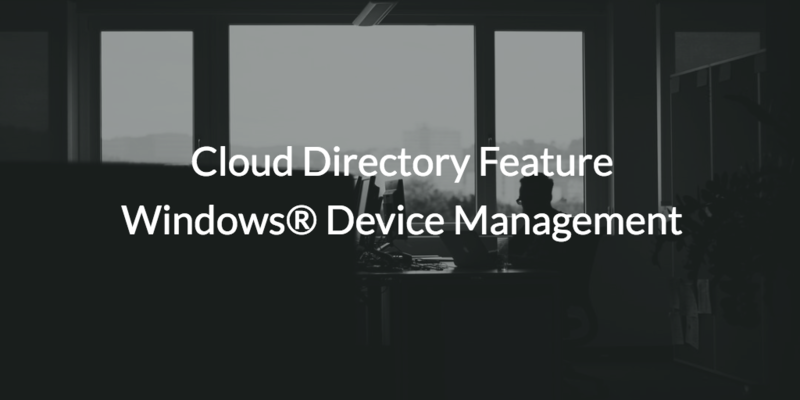 What are IT admins looking for in a cloud directory feature for Windows device management? To answer that, we need to take a brief look at the history of directory services and the tools IT organizations have used in the past to manage Windows devices. As we know, for nearly the past two decades the on-prem directory service leader has been Microsoft® Active Directory®. AD was introduced in 1999 when the world was largely Windows-based and on-prem, and it was warmly received. What many didn’t know was that Microsoft was simultaneously leveraging AD to further lock-in their customers to Windows solutions. However, by letting Microsoft subsume their environment, IT admins achieved effective control over the users and systems in their environment. This effective control had a lot to do with a core AD capability called Group Policy Objects (GPOs). Using GPOs, IT admins were able to set policies across their entire Windows fleet. These policies were great for enforcing security policies and mapping drives, printers, and file servers to end users. IT admins could also leverage their own PowerShell scripts to execute custom tasks. This approach to Windows user and system management worked well for a number of years. But, many changes in IT infrastructure have put pressure on the on-prem identity provider. ← Are You Securing Cloud Storage Wrong?